On Friday (June 8, 2018), a new movie entitled "Mister Rogers: "Won't You Be My Neighbor?" opens nationwide (although its running mainly in art-house, indie, and/or repertory cinema venues). This particular movie is a biopic about the late host of the long-running PBS children's show entitled "Mister Rogers' Neighborhood". The biopic will open around the fiftieth anniversary of his long-running (having run for 33 years) children's show premier in the United States, which only left the airwaves as a first-run show in 2001. The subject of this biopic first began his television career in 1963 with a children's program that ran on Canada's CBC network. Three years later, in Pittsburgh, he created a regional show he called "Mister Rogers' Neighborhood". In 1968, it began its run of more than three decades (33 years' total) on PBS, where it became a gently instructive, supportive safe-harbor for several generations of children. All told, there were about 900 episodes recorded, which is an impressive track-record. Fred McFeely Rogers was born in Latrobe, PA which is about 40 miles east of Pittsburgh. Fred Rogers died in 2003 at age 74 from stomach cancer. During his lifetime, he earned a degree in music, and was preparing to enter seminary school after graduation when he saw a television for the first time at his parents' home. His reaction to the show was not one of thrill, but of dismay. The show he saw featured throwing a pie in another person's face, which he saw as unnecessary violence to get a laugh at someone else's expense. His response was "We can do better". Fred Rogers' real calling turned out to be a kind-hearted, neighborly, nurturing connection and host to his audiences who symbolized warmth, comfort and reassurance for children on television. Indeed, during his show's run, he addressed many tough issues including the topic of divorce which would peak in the early 1980's just as Gen X kids were growing up, as well as addressing the Space Shuttle Challenger explosion in 1986. Those were topics that were largely ignored by most other children's shows at the time, even though they were genuine issues kids were confronting. In the 15 years since Fred Rogers died, he's enjoyed something of a second life as an internet celebrity. More than a few times, usually during yet another federal government debate about budgetary priorities, someone will dig up and pass around the video of Fred Rogers' testimony before Congress about the necessity of funding PBS from May 1, 1969. Fred Rogers testified before the Senate Subcommittee on Communications to argue against proposed funding cuts to PBS. Then-Senator John O. Pastore, who was the subcommittee chairman, had clearly never even heard of the host or seen any of his shows, but after only six minutes of testimony by Fred Rogers (including one song, recited from memory, about anger management), the politician went from a gruff, dismissive foe to a lifelong fan. The organization that honor's Fred Rogers' memory has also deftly reminded people (again, using the internet) of how Fred Rogers reassured children in the wake of any tragedy or disaster, to the point where people today almost reflexively share his simple advice to children: "look for the helpers." Of course, these days PBS (much like NPR) receives very little funding from U.S. taxpayers anymore. It operates largely as a commercial entity with lucrative sponsored programming (except without the regular commerical interruptions), as well as grants from various non-profit foundations. But in 1969, PBS was still an exception seen as advancing public interests rather than being for unencumbered commerical interests. But the insignificant amount of remaining public support for PBS and NPR continues to be a source of anger from conservatives who believe public funding has no place in broadcasting, and the resent their more balanced news coverage since conservative media are known to promote outright falsehoods to advance their particular political agenda. But Fred Rogers enjoyed lasting success educating and entertaining children on television. Among numerous awards for excellence and public service, Fred Rogers won 4 daytime Emmys between 1979 and 1999, as well as a lifetime achievement award from the National Academy of Television Arts and Sciences in 1997. 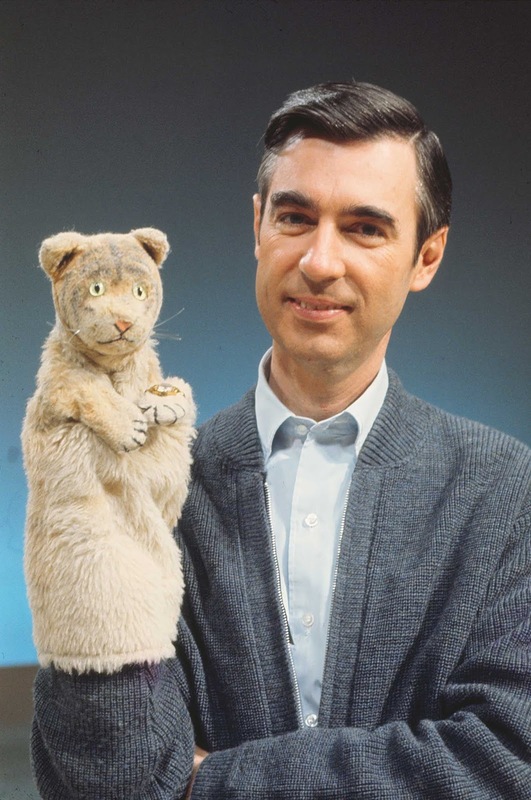 By the time Fred Rogers retired from TV at the age of 73 in 2001 (as noted, he died of stomach cancer less than two years later), the show did kind of feel like a relic, a window onto simpler times in the world of children's entertainment, like the 1950's. But Fred Rogers didn't behave like a normal guy, either — certainly not the macho ideal that trained boys to bury their emotions deep inside. He wore pink and lavender and he told everyone — even other grown men — that he loved them. And he hated superheroes, which he found so phonily inspirational he brought his own show back from hiatus solely to battle the influence of the late "Superman" actor Christopher Reeve. He argued that a true hero wouldn't make a kid throw punches and jump off roofs. They'd bring peace by being peaceful. Indeed, Fred Rogers had an unshakable sense that he was always right. While the new biopic and a recent PBS special (see below) commemorating the anniversary of his long-running TV show have been mostly accolades (many well-deserved), its worth noting that the persona known as Mister Rogers, although largely recalled with fond memories, as noted above, was not without critics -- even among the very children whom the show was meant to serve, although memories of him are mostly fond. Faux (Fox) News Called Mister Rogers "Evil"
In an early (shortly after the cable network began) Fox News critique of Fred Rogers, he was described as "evil" man who "ruined a generation of children" [meaning Millennials] because his message to young children - that they were special just for being who they were — which Fox News said lead to narcissism and attitudes of entitlement. The Fox News commentator then asked if kids believe they are special, why should they work hard and try to do better? That early Fox News commentator no longer works in broadcasting, whereas Fred Rogers worked for more than 40 years in the medium. In fact, the term "evil" used by Fox News to describe Fred Rogers in its nascent years was an unequivocal falsehood, because Fred Rogers was trained and ordained as a Presbyterian minister, which is the very antithesis of evil. I would remind everyone that even when I was a child in the 1970's, in spite of a more indifferent reception among the kids the show targeted, nearly everyone still saw the show -- at least on occasion. (For me, it preceded or followed The Electric Company, which I watched for the Joan Rivers' narrated character Captain Letterman, catch my reference to that at http://hgm.sstrumello.com/2013/02/joan-rivers-from-adventures-with.html). Because of that, I occasionally watched Mister Rogers as I awaited the show I was tuned in for. Mister Rogers was also described by kids when I was growing up as gay, even though he was recognized as a very devoted family man who was married to his college sweetheart Joanne Rogers for 50 years until his death. The couple shared two sons. David Newell, who played Mr. McFeely on the original series, said of the couple "They were perfect together. They were both musicians, and they had twin pianos in their living room, which they would play together." But the term gay was never used to describe his sexual orientation, rather it was meant to be a term of derision. But his tone of voice (calm) and his nerdy-outfits (usually with a cardigan sweater and his un-trendy sneakers) were not considered aspirational by many kids back in the day. Indeed, in 1981, Eddie Murphy introduced a parody called "Mister Robinson's Neighborhood" which was intended to be a ghetto version of the genuine, lilly-white Mister Rogers, premiered on the TV show "Saturday Night Live" (catch a 1983 clip at https://www.nbc.com/saturday-night-live/video/mr-robinsons-neighborhood/n9117 for reference). As Wikipedia notes (see HERE for detail), in the sketch, Eddie Murphy's character, named "Mister Robinson", speaks and presents the show in a similarly stilted manner, but lives in a considerably grittier venue and engages in a number of illegal and/or unethical activities for money due to his lack of a job, which he educates his young viewers about in each episode while at the same time teaching them cynical views on the government and life in general. For the record Fred Rogers actually took no offense to the Eddie Murphy parody (he was acknowledged to have a great sense of humor, as the new biopic movie will show). On the contrary, he said found it amusing and affectionate. The parody was also initially broadcast at a time of night when his own child audience was not likely to see it. I should also acknowledge that next year, another new film about the PBS children's show host starring Academy Award winner Tom Hanks entitled "You Are My Friend" will also open, although that film is focused on a reporter and [Mr. Rogers'] relationship to his life, and how [the reporter's] whole world changes when coming in contact with Fred Rogers. That film [will be about] "one man who's in a critical point in his life — becoming a new father, having issues with his own father — and meeting Mr. Rogers to write a piece about him, thinking it's going to be a bit of a puff piece, but it ends up changing his entire life." Separately, a book entitled "The Good Neighbor: The Life and Work of Fred Rogers" which will be the first full-length biography of Fred Rogers written by Maxwell King is set to be released by Abrams Books on September 4, 2018. In the end, Fred Rogers' character Mister Rogers is being celebrated for the memorable contribution he made to popular culture, and to adults who tuned into his show as children. As the recent PBS special "Mister Rogers: It's You I Like" (originally featured at the website https://www.pbs.org/video/mister-rogers-its-you-i-nwxrdh/ which also featured a streaming version of that special, it has since been removed) featured numerous celebrities including a few Gen Xers such as Sarah Silverman. Again, while the retrospective is mostly adoration, Fred Rogers' had occasional critics for various reasons back in the day, but his underlying legacy will be the messages he taught. His subtle message of acceptance and tolerance made a very lasting impression on children like me who weren't necessarily even watching his show because they were regular viewers. Author P.S., July 31, 2018: The Associated Press (AP) and other news sources reported that PBS stations plan to air the acclaimed documentary "Won't You Be My Neighbor?" as part of the "Independent Lens" showcase. An airdate for "Won't You Be My Neighbor?" wasn't announced at that time, so they advise viewers to keep abreast of the schedules for their local PBS station and the "Independent Lens" showcase that airs on the network. (see https://apnews.com/481f0064a4354f8eb13e1408272a0f7f for the AP news article). Beyond the PBS premier, it is also coming to the free streaming service (with a library card from a number of public library systems) known as Kanopy, see https://www.kanopy.com/wayf/video/mister-rogers-its-you-i for details on that). Labels: 50th anniversary, Fred McFeely Rogers, Fred Rogers, It's You I Like, Mister Rogers, PBS, Retro Television, television, The Good Neighbor The Life and Work of Fred Rogers, TV, Won't You Be My Neighbor?